It was not by coincidence that Jesus chose a garden as the setting for the greatest battle of His earthly life. Wasn’t it in a garden that His ancestor, First Adam, had rejected Life and condemned all his descendants to eternal Death? And so here He was, Last Adam, with the stench of Death already assaulting his nostrils and circling His soul greedily. He who is Life knew that stench. He had encountered it more than once: lurking in the house where the little girl had lain pale and motionless; clinging to the open coffin of the widow’s son; and not many days ago permeating the rocky cave where Lazarus’ body had been laid. He had seen enough of Death to recognize his sinister, menacing presence now hovering over His own soul like a vulture anticipating a long awaited feast. So this was what it felt like! This futile sense of inevitability, this hopelessness, this terrible aloneness! The very atmosphere seemed saturated with a creeping darkness, crushing heavily down on Him, flooding His soul with an ancient and irresistible grief. The decisive hour of battle had come, an hour He had known would arrive since the Beginning. Did they understand what He had meant when He requested they watch with Him? The entire garden had been transformed into a field of intense battle, a battle that would determine their fate and the fate of all humankind. But even now He sensed the same sorrow that sought to crush Him was descending upon them also. Rather than watch, they would sleep, for sleep was humanity’s only respite for things beyond human control. Burdened in spirit beyond anything He’d previously experienced, Last Adam fell on His face before Abba, releasing the tears that stung His eyes and burned His throat. Now would They enter the conversation They had so long planned. Now, depleted of all bodily strength, He would draw solely upon Abba’s steadfast love for Him. In no other way could He endure the imminent battle. Not a fruit this time, but a cup, was presented to Last Adam. No sweetness wafted deceptively from this putrid cup, no promise of false righteousness or god-likeness. Such enticements would have been wasted on this Last Adam. This cup was bitter with a bitterness never before tasted by any of First Adam’s descendants. Into this cup Death had poured himself in full measure. The One who is Life, from whom all created life had originated, looked deep into the cup of Death being presented before Him with no illusions. We cannot, in this life, know or understand the fullness of what He saw. But what He saw was the exact opposite of Himself. Every misery humanity has endured and continues to endure (for a limited time) since First Adam walked pitifully out of the first garden – pain, betrayal, hatred, war, sickness, despair – was contained in that cup. And permeating all was Death. Life looked into the darkest recesses of Death, and with an enmity born before the foundation of the world, Life utterly abhorred what He saw. So offensive, so thoroughly repulsive, were the contents of the cup to Last Adam, even His body of flesh convulsed at the thought of drinking it, as sweat and blood formed in great droplets that fell heavily on the ground where He lay before Abba. “Let it pass, let it pass, there must be another way!” He wept in anguish and distress. But even as He uttered such words, He and Abba both knew there was no other way. The battle of all eternity now raged unconstrained, there in a garden called Gethsemane – ‘the olive press’ – on a mountain near a city – a city full of people unknowingly awaiting the outcome. Life and Death wrestled one another for victory. The prize was the future of humankind. First Adam had received Death on behalf of all humanity and consigned all humanity to Death. Defeated and unable to face its self-imposed catastrophe, humanity had removed itself from the holy Presence of God. The garden became a distant memory, a legend, a sad and incomprehensible tragedy whispered of softly around campfires and told to children at bedtime. Angels gathered reverently to witness the unfolding drama on the garden battlefield, just as they had witnessed the departure of First Adam from that other garden at the dawn of time. One of them followed Abba’s directive to minister spiritual strength to this Last Adam as He wrestled with Death. It was the only angelic service permissible. All the host of Heaven understood that this excruciating battle was about humanity, and only the One who had willingly become human flesh could contest it. Within Last Adam, human will struggled to surrender without reservation to what had been agreed in the Threefold Counsel of Elohim in eternity past. He knew this decision was ultimately His. Love does not force its will upon Another’s will. But equally, Love seeks the will of the Other. He knew Death would waste no time in assuring His removal if He should drink the cup. Plans for his execution were already being put in place, but could not be carried through UNTIL and UNLESS He drank that cup. For what even His disciples did not understand, but all Heaven and Hell knew, was that He could not die as other men would inevitably die. He had told them, but as so often happened, they missed His meaning. ‘I will no longer talk much with you, for the ruler of this world is coming, and he has nothing in Me.’ Satan had been consigned to the sidelines, waiting for the outcome of the dramatic event in this garden-battlefield. Yes, the evil one had come, having left Him for a season after that momentous encounter in the wilderness. Now he too was watching the crucial battle impatiently, unable to intervene, as his servant Death wrestled for supremacy. Because Satan had nothing in Last Adam. Last Adam, unlike First Adam, did not know sin. And sin was the only entry point for Death, Satan’s great weapon of mass destruction. Satan understood all too well this sinless Last Adam could never die, unless He Himself surrendered His own fleshly body to Death. And then it was over. With one final, terrifying groan, with unspeakable anguish carved on His face and chilling resolve blazing from His eyes, Last Adam laid a formidable grip on the cup and drank it down……every last drop. Angels gasped. Hell erupted into grotesque celebration. Death gloated and licked his lips lasciviously. But Abba smiled a brokenhearted, tear-stained smile. The battle over, Last Adam arose to embrace His victory. He knew exactly the cruel nature of the execution Death had planned for Him. But fear of the coming suffering had never been the focus of the battle. The suffering of Calvary would arrive swiftly in the coming hours, but the battle for Calvary had already been fought, here in the olive press garden. The battle had not been about facing Calvary’s suffering; the battle had been about Life tasting Death …. willingly and sovereignly. In the days to come those who could not perceive it yet, including Satan and his servant Death, would come to realise that which now looked like Hell’s grand victory was actually Hell’s resounding defeat. It had been here in an inconspicuous, lowly garden Endless Life defeated Endless Death and Heaven grasped victory over Hell….for all eternity hereafter. Calvary with its brutality, blood and ugliness would be the victorious demonstration of what had taken place here, in this garden, when Last Adam reversed the actions of First Adam. 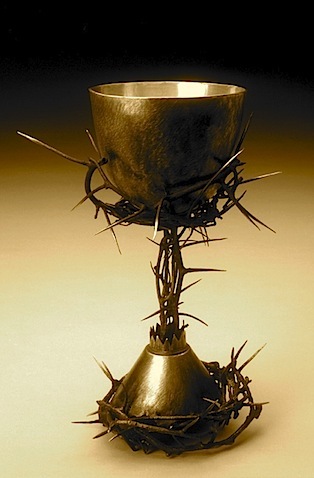 Shall I not drink the cup which My Father has given me? asked Jesus of Peter in the aftermath of the battle. The question had already been answered. First Adam, born to live, had tasted Death and sentenced all humanity to die with him. Last Adam, born to die, had tasted Death so all humanity might live through Him. No one, human or demonic, had power to take His sinless Life, so He willingly laid it down (Jn. 10:18). It happened in a garden. In yet another garden He would very soon demonstrate His absolute conquest over Death – by taking up again His Endless Life. © Cheryl McGrath, Bread for the Bride, 2015 and beyond Copyright Notice: Permission is granted to freely reproduce any Bread for the Bride articles in emails or internet blogs, unaltered, and providing this copyright notice is included. To permanently display an article on any static website please contact me for permission. Powerful to the stirring of my very depths. The price He paid for me, with such love. I love Him. Thank you for being His voice conveying that love to many, Cheryl. Hi Cheryl, Thank you for this! I agree, it was beautiful and gripping! It makes me appreciate even more, today, what our Lord passed through to get to His Bride. It is interesting, that the defeat of the first garden saw a victory in a garden. I’ve thought of this very possibility…that the reason the Lord went to the cross as a silent lamb goes to his sharers, is that the battle was already won at Gethsemene. The thought of him even shedding blood there, through his pores, is very special. Wonderful and absolutely gripping analysis. Beautifully brought out. Thankyou Lydia. Sometimes we forget the full scope of what Jesus went through for us. In August of 2014 my wife and I had the privilege of touring Israel for ten days. Of all the ‘holy places’ Gethsemane was the place that impacted me most, emotionally and spiritually. The pain, the cost, and most of all the love. Thanks for these insights, Cheryl. Great to hear from you Erroll!